The build up to Easter started bitterly cold, a heavy snow fall followed by bitter winds have kept me out of the garden till now. The Run up to Spring was a challenge. 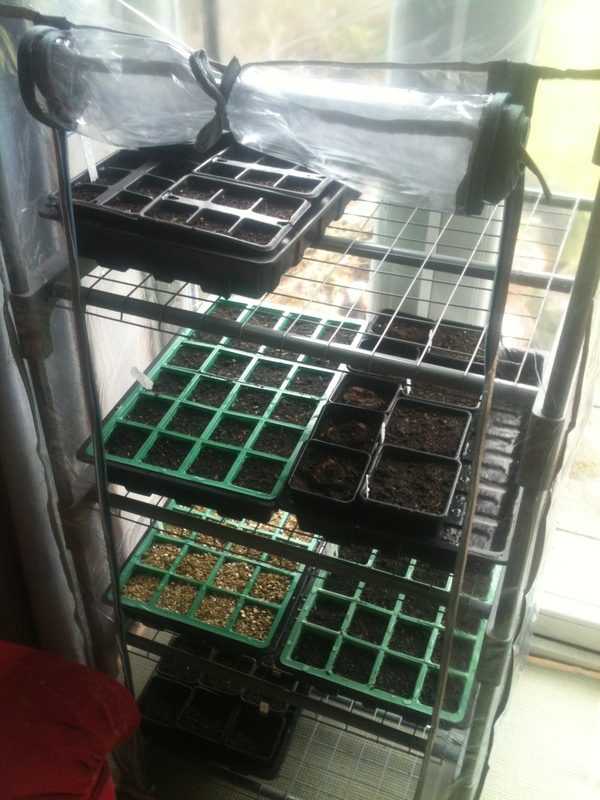 I’ve already estimated that I’m two weeks behind from my preferred flower sowing dates, so on good Friday I stealthy moved my recently purchased ‘Mini zip up greenhouse’ into the back room by the window without him indoors noticing, and set about sowing a few seeds of my chosen flower selection for this year. 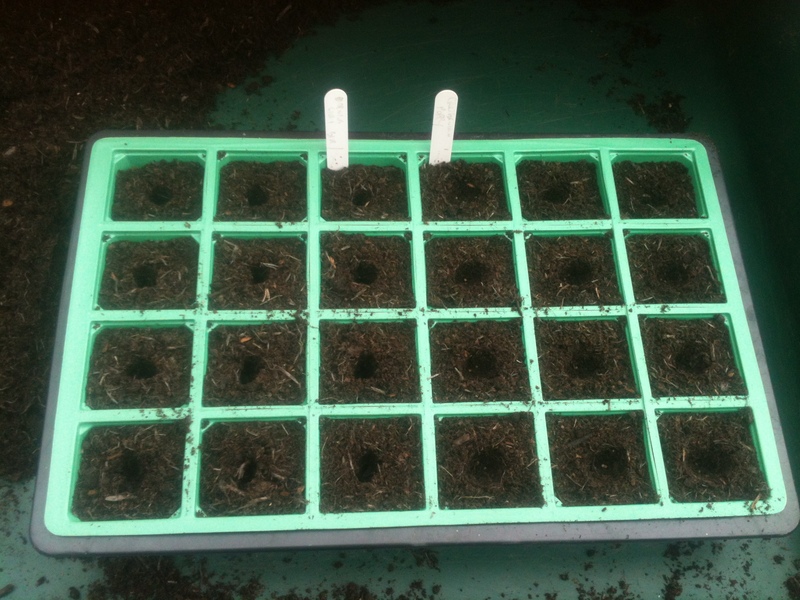 My two greenhouses are unheated and the night time temperatures are just about at freezing, which is too cold for seed sowing, so it was start a few seeds in the house, or find away to heat one of the greenhouses, but I really don’t want to do that. I’m hoping when the seeds germinate and they need to go back out to the greenhouse in about 3 weeks the night time temperatures will be high enough not to do any/much damage. However the forecast for the next week and a half is similar temperatures to what we are currently getting, which is between 4.0 °C – 5.0 °C in the day and -2.0 °C at night with a white frost. Ready to zip up and see what happens. I still have plenty of seeds spare from each packet, in case of disaster and still plenty of others packets to sow when warmer. There is not much happening in the garden at the moment due to the cold, although I have started to notice my baby Malus tree has buds that are starting to swell, and also the odd weed has started to appear here and there. 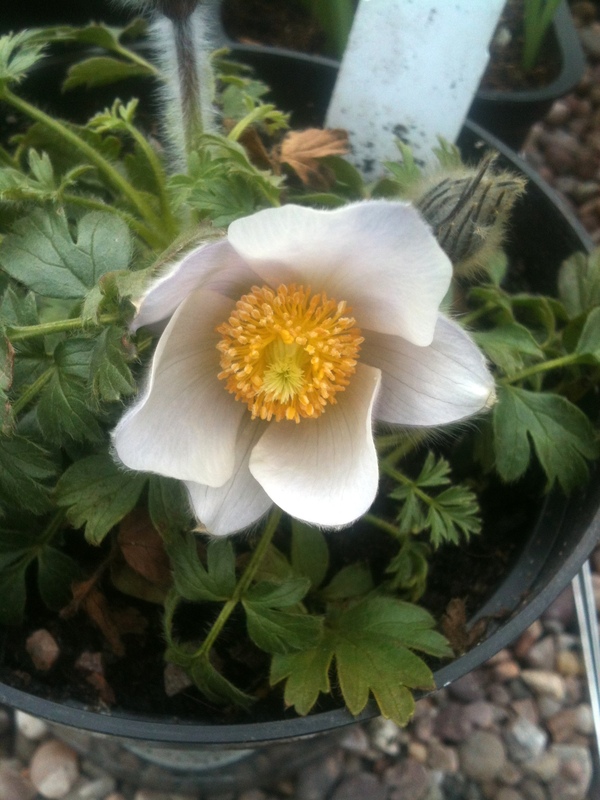 I discovered one of my Pulsatilla’s has bloomed and its a very welcome site.! Pulsatilla in flower, otherwise known as the Pasque Flower. There has been a lot of talk across the social media network recently about supporting British Growers and Nurseries, so I decided on Easter Saturday to visit a couple of places I knew about locally but had not visited for a few years. 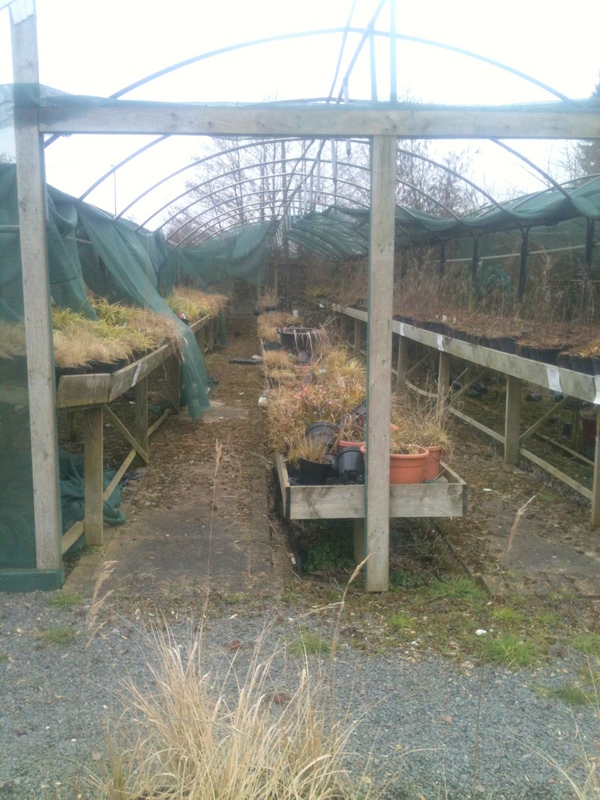 The first place I visited, who shall remain nameless, looked abandoned in a weird ghost town kind of way, I’ve never seen so many weeds in pots, obvious wind damage left unrepaired and poly tunnels half collapsed with stock optimistically still for sale inside. Incredible mess, I did not venture in.! Second Polytunnel, with stock plants recently placed in there…. 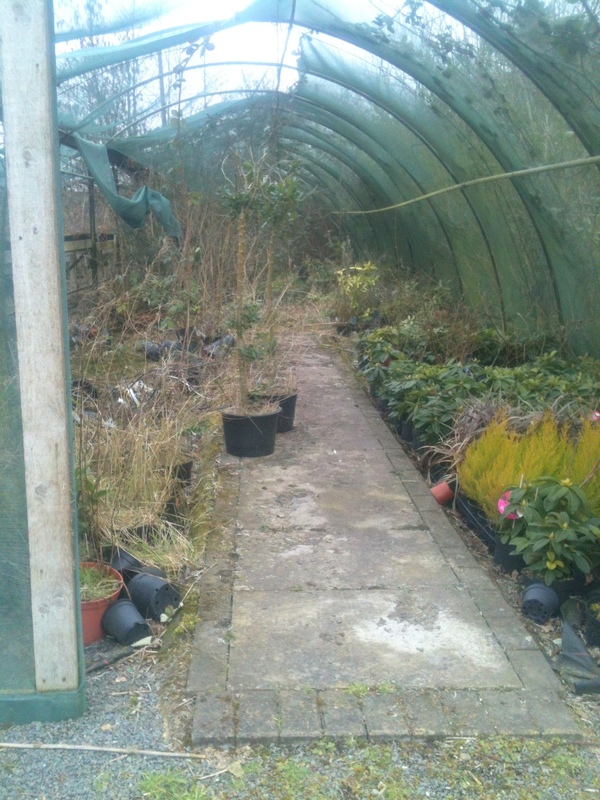 see the bright conifers on the front right..
Another Tunnel with quite mature Brambles throughout. After seeing this Polytunnel I left and went home empty handed. 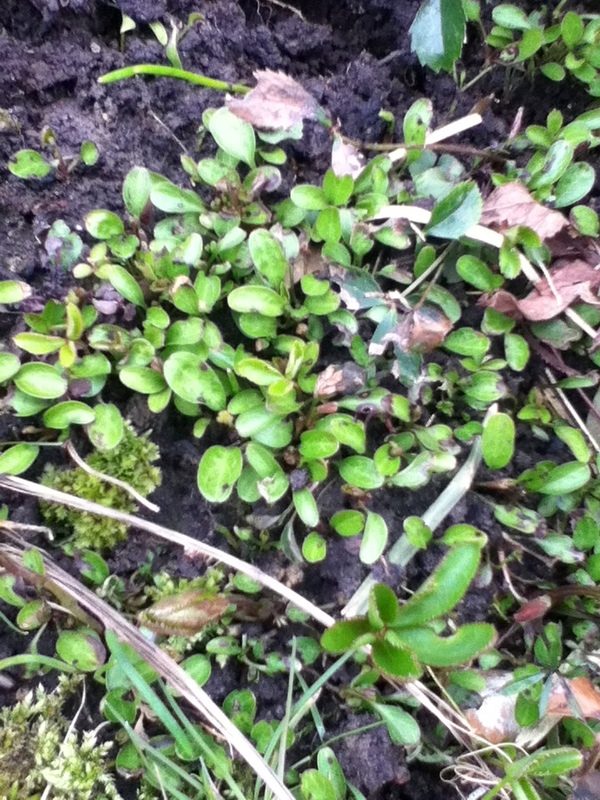 On Easter Sunday I braved a few hours in the garden well wrapped up against the cold and set about some weeding. I noticed the surface soil has become quite dry, and was pleased at how several clay lumps of soil that where left over from a border widening job last year just crumbled into tiny particles when I pulled my cultivator through them. Whilst weeding I found a plant I thought I’d lost a year or two ago, My Astrantia Major ‘Claret’ which appears to have been buried by my Sarcococca was just starting to sprout, so I dug it up, divided it and now have two pots for re-planting elsewere in the garden later in the year. I found another plant nearby, but for the life of me I have no idea what it is..? I’ve looked at a photo I took last July of this area and it looks like a tall Hardy Geranium, but with no flowers, so I will just have to keep an eye on this one and see what it turns into.! 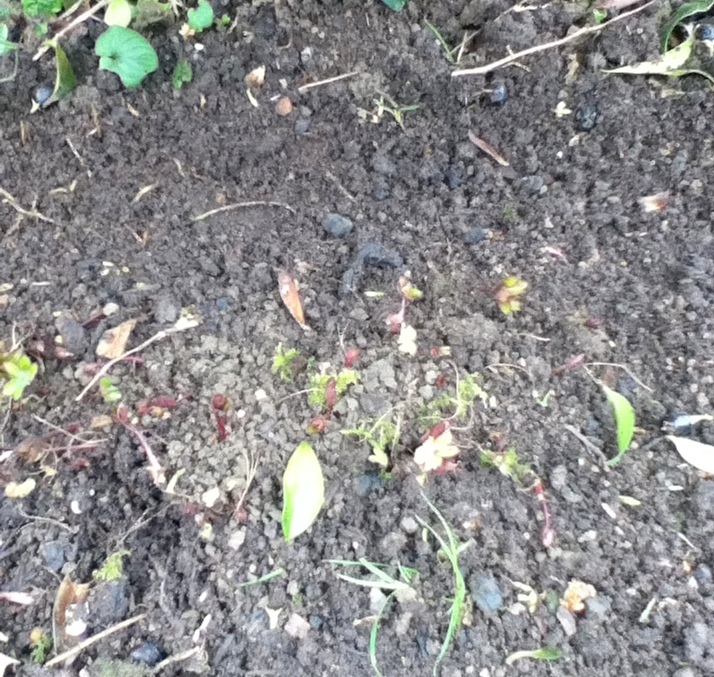 I also came across a big patch of Hellebore seedlings, and will pot a few on for swaps. 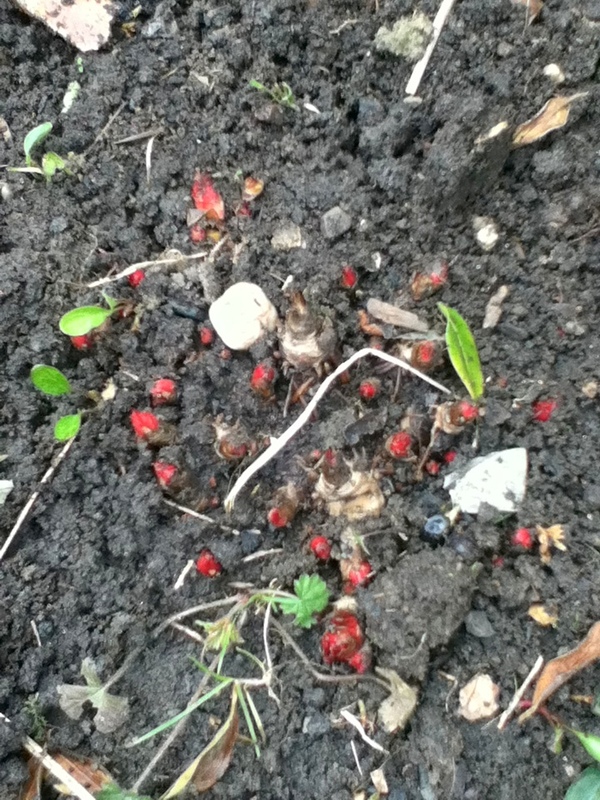 Baby Hellebores… hundreds of them.! Another job that is perfect at this time of year is dividing and transplanting Snowdrop clumps, whilst weeding I dug up two big clumps and divided them into about 8 smaller groups and re-planted them where I will be able to see them from the back window next Spring. 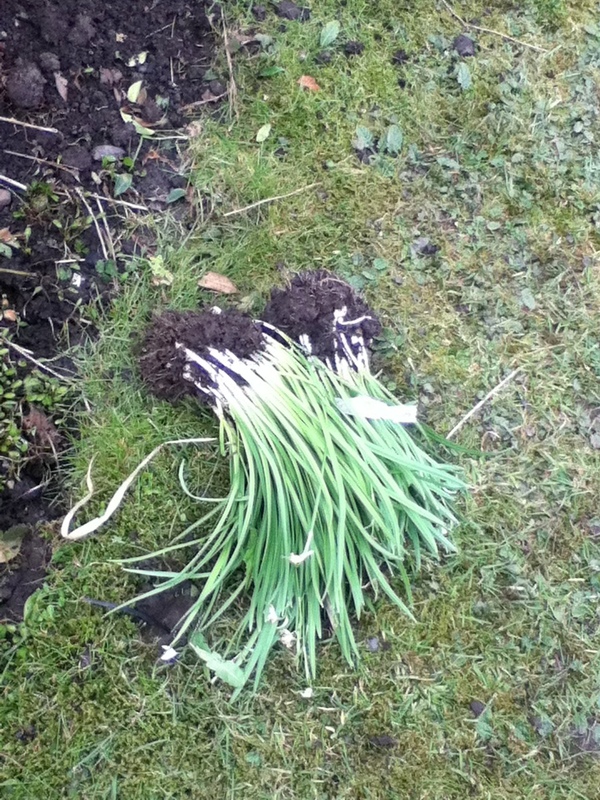 Snowdrop clumps before dividing up and transplanting. 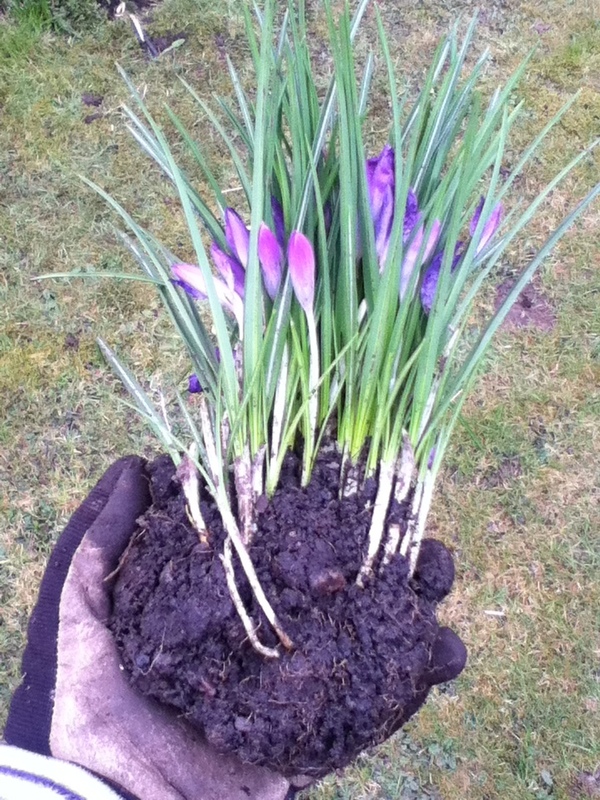 I also planted out about 4 small clumps of Crocus tommasinianus which I had been given by a work colleague. These are a lovely bright purple and apparently can become quite a prolific spreader in the right conditions. 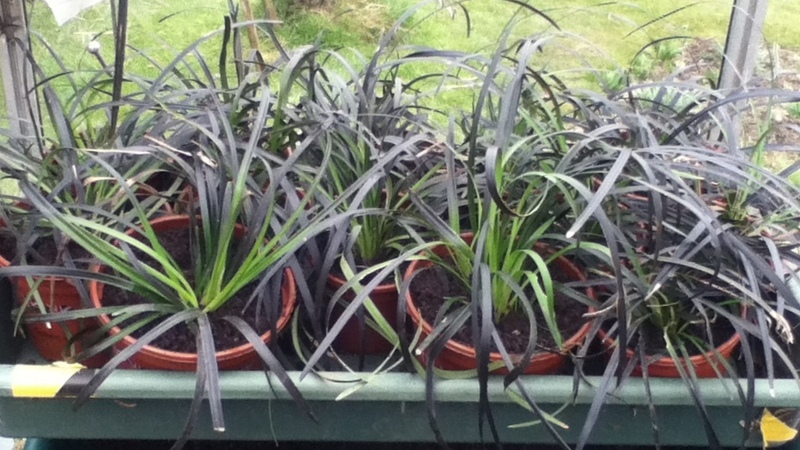 I also had quite a scruffy patch of what people call the Black Grass plant, but is in fact a type of Lilly, its called Ophiopogon planiscarpus Nigrescens and after tidying it up I was left with lots of plantlets for potting up. 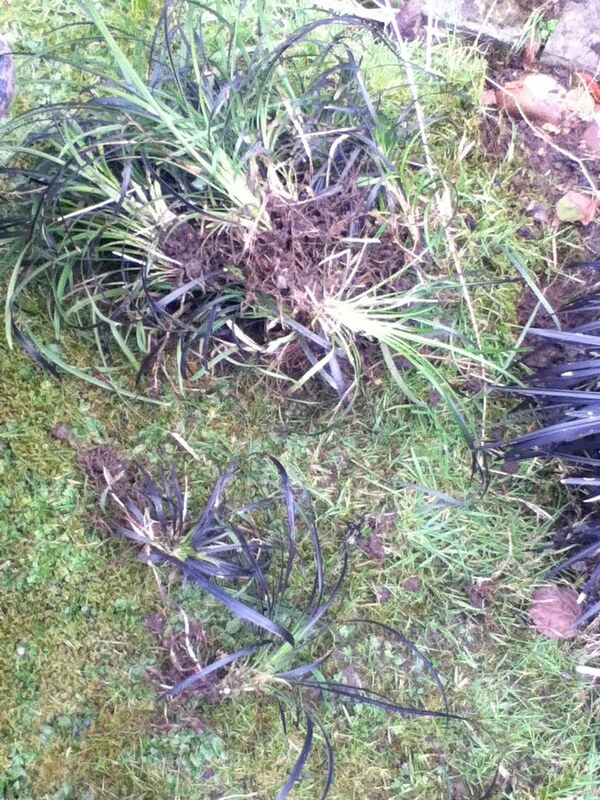 The incorrectly named ‘Black Grass’ Plant. After potting up the plantlets I’ve gained 13 pots of new plants.! At this rate I’ll have to start up my own plant swap soon. 13 new pots of plants. And I’ve not even started on my Hosta Collection.! I just wish it would warm up a bit more, I was feeling the cold after a couple of hours and had to retreat to a hot bath. Now where did I put that Easter Egg…..? What an industrious weekend you have had! 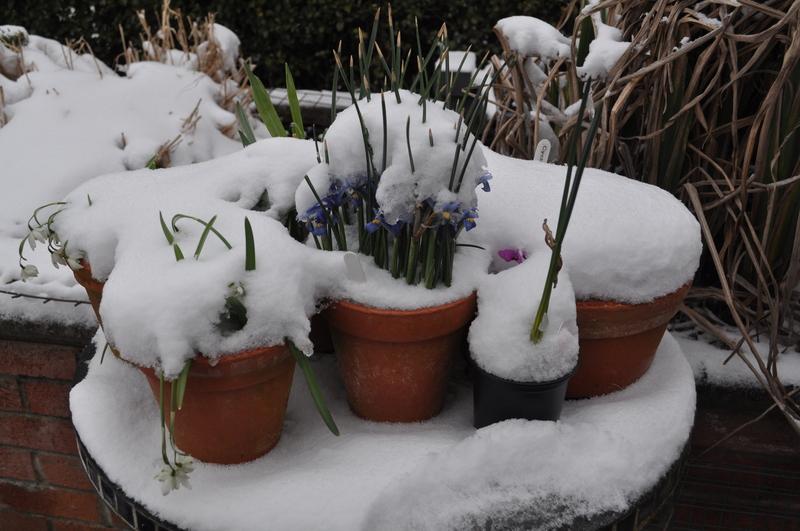 You seem to be in the same situation with your seed sowing as I am – it seems daft to add heat to the greenhouse when we have warmth in the house, but it is getting a bit overcrowded here! I am glad there is someone else who finds things coming up that they don’t have a label for – I thought I had cracked the label issue some years ago but obviously not! Spring has been such a struggle this year. Thank you for your ‘likes’. 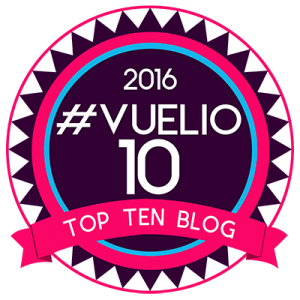 I’m following your blog now. 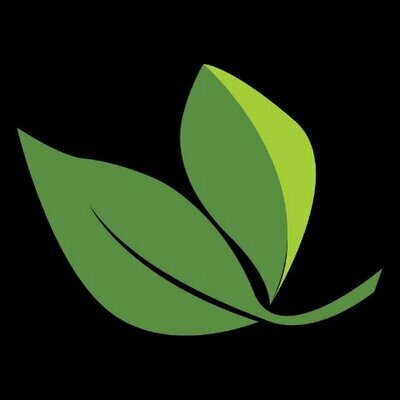 I wonder if your unknown plant is G psilostemon? I feel your pain with the weather over here near Toronto! We are over a month behind where we were last year, I’m sure.